Ferdinand Magellan is a name all children learn at school. His noble figure transcended the time from 1500 to the present era. He was a Portuguese born into a family of nobles, around 1480s. He was appointed by the King Charles I of Spain to discover a n alternative route to the so called Spice Islands. His expertise as a skilled sailor and a naval officer, along with his achievement of being the first circumnavigator of the Earth, kept his name alive in all the history books. His five vessel fleet was the first to cross the Atlantic Ocean and arrive through the Strait of Magellan to the ‘peaceful sea’, which is known today as the Pacific Ocean. He had a crew of 270 men that accompanied him on this journey. Their nationalities were Portuguese, Spanish, Italian, German, Greek, English and French. The crown of Spain, which covered the trip supplies for two years, funded the expedition. The five ships in the fleet were called Trinidad, directly commanded by Magellan, San Antonio, Conception, Santiago and Victoria. Although his adventures on the sea were sprinkled with storms and mutinies, he reached the Maluku Islands and returned back home through the Indian Ocean, thus making a full circuit of the globe. They kept a rigorous diary of the trip, and returned only with one day of delay. This had happened because they have had travelled west, thus opposite the rotation of the Earth’s days. 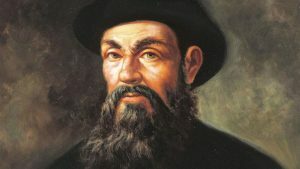 Although he did not make it home alive, being killed in the Battle of Mactan, in 1521, his name was given to many other findings seen from the first time during this brave expedition, which took place between 1519 to 1522. One example is the Magellanic penguin, the Magellanic Clouds, the twin lunar craters of Magelhaens or the martian crater with the same name.